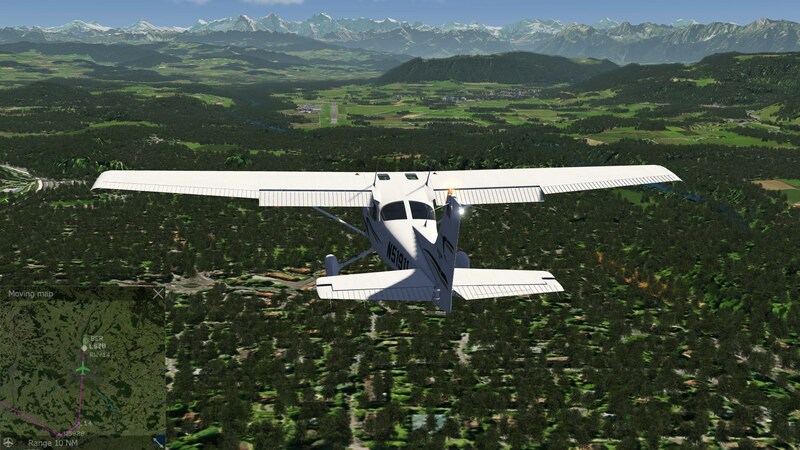 This is a short route from Birrfeld to Bern, in Switzerland, using aerofly FS 2 sim (AFS2). We use it to test different autopilots and instruments, from old to modern, and simple to advanced. I made this route and webpage for my own sim-training! Horisontal indicator gyro, Altitude barometer, Nav1 radio. 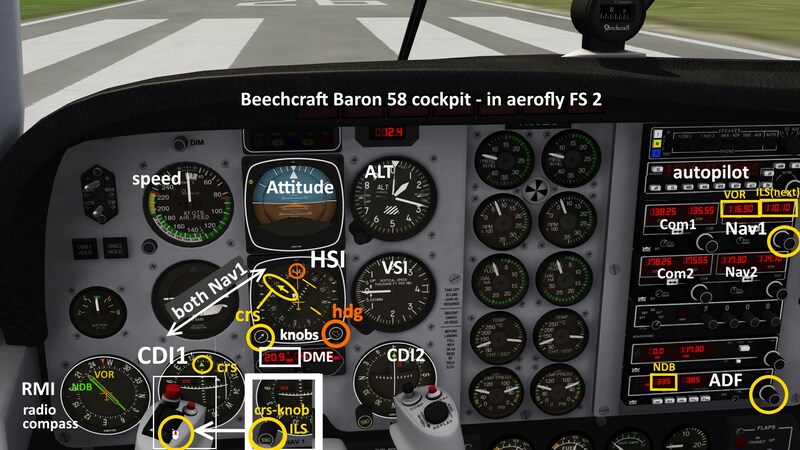 • Flight 2 in Baron 58 with a HSI.
! 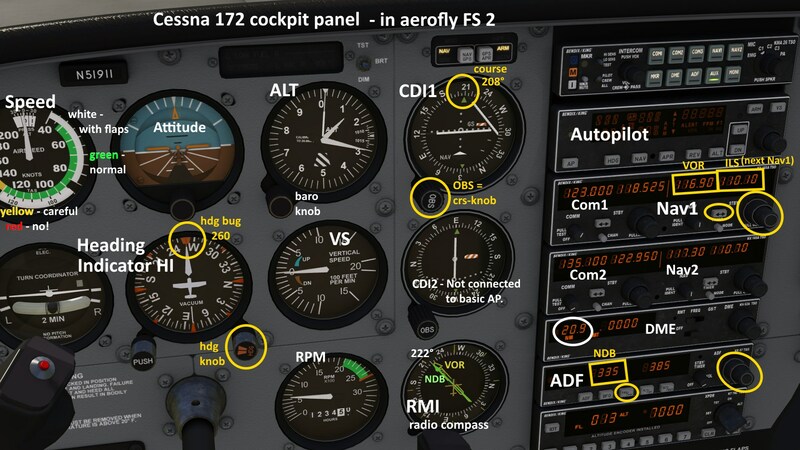 Comments and corrections are very welcome - New topics for me, and I am only a sim-pilot! • Contact, see below! 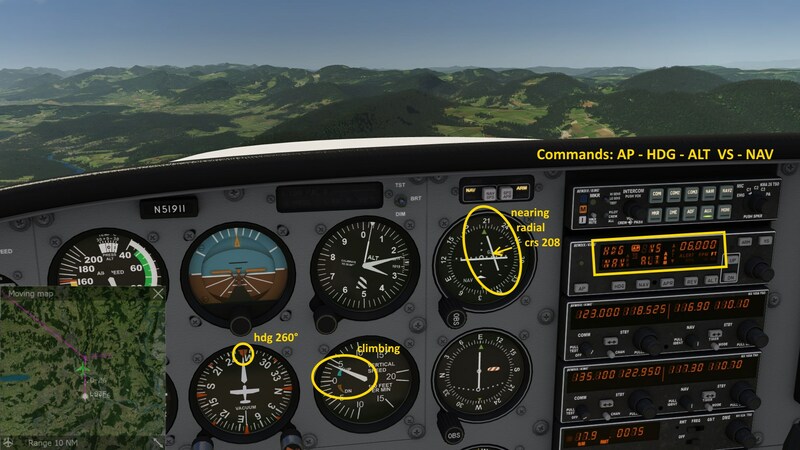 [APR] = Approach ILS, [ALT]+[ARM] = Altitude+select, [VS] = Vertical Speed [up][dn]. - Image: HDG selected, climbing VS 500ft/min to an armed ALT (not shown). 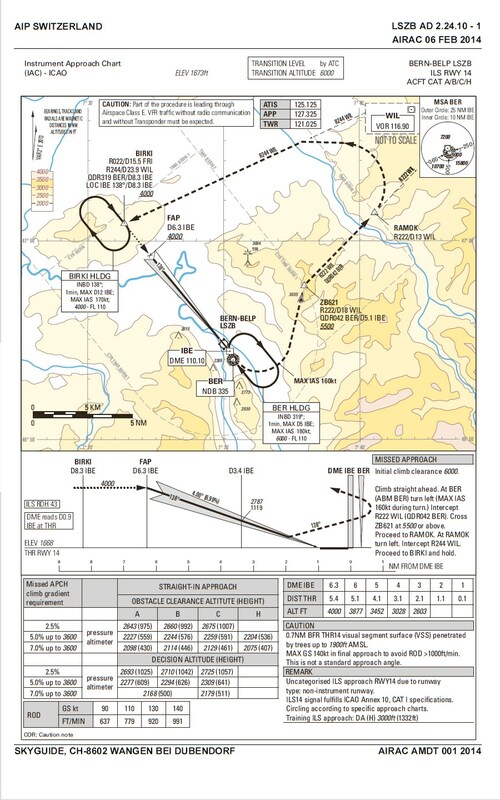 This flight plan was made in AFS2, but can be created in many other sims too. 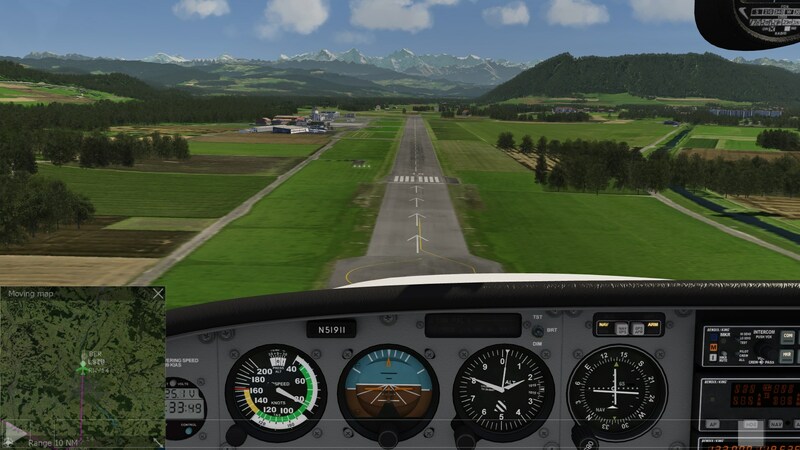 - Start: LSZF Birrfeld Rwy26. - Navigate: via VOR WIL. 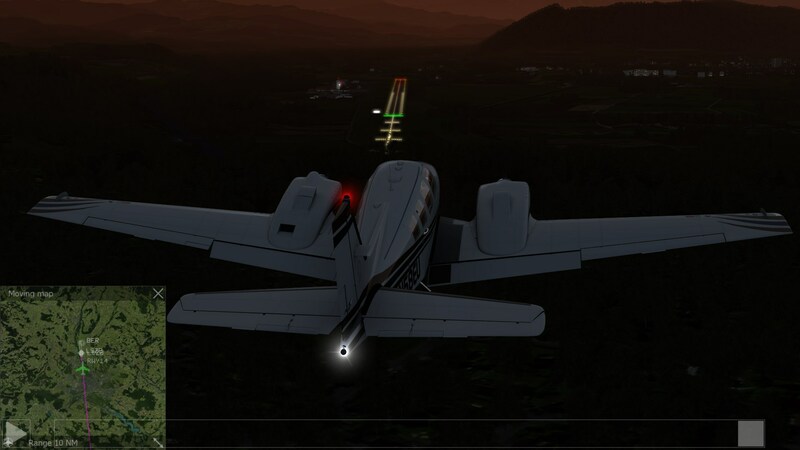 - Landing: ILS Rwy 14 at LSZB Bern-Belp. - Change heading [HDG] several times. - Activate VOR using [NAV], and ILS using [APR]. You must handle throttle, flaps and gear. Only advanced AP have speed & throttle control. Fig 1. 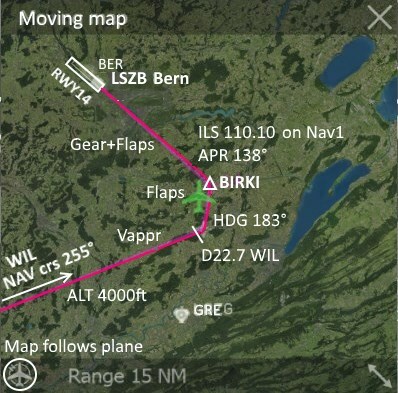 Flight plan Birrfeld to Bern-Belp. Click för larger images! 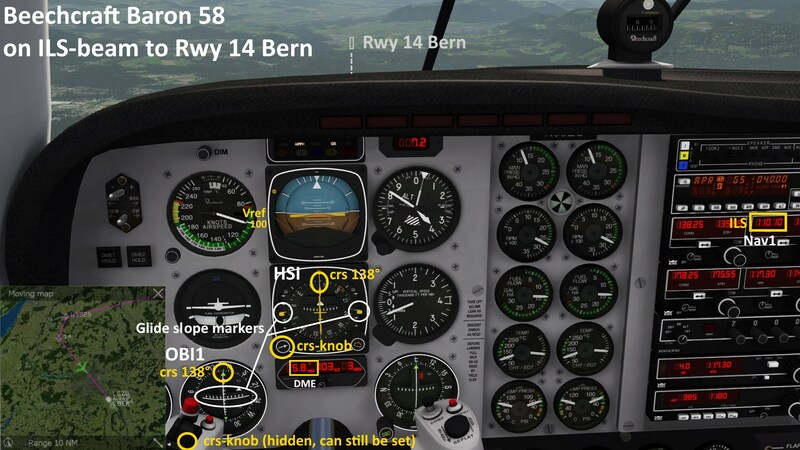 Start the sim and put airplane at Birrfeld Rwy 26.
heading bug to 260° = Rwy heading, use mouse wheel! We will change hdg several times. 2. Nav1 set VOR WIL freq 116.90, swap to active. 3. Nav1 set ILS BER freq 110.10, keep as standby. course bug to 208° - for southwestern leg. You will change to 255° after WIL, and to ILS 138°. 5. ADF freq NDB 335 at Bern, swap to active. and DME shows distance 20.9 NM to VOR/DME. both happen to be at bearing 222° now. - Stabilize climb and speed. [ALT] and quickly [VS] [up] to e.g. 400 ft/min. - Aim for VOR WIL by [NAV]-click. VS 600ft with ALT Arm below. - In AFS2 VS is set to 0 at ALT-click. Not standard! AP --> HDG --> ALT + VS --> NAV. - click to see larger image! and then follow it - using CDI1. - Standard procedure for VOR-navigation! Do settings in correct order! It took me several landings to succeed! 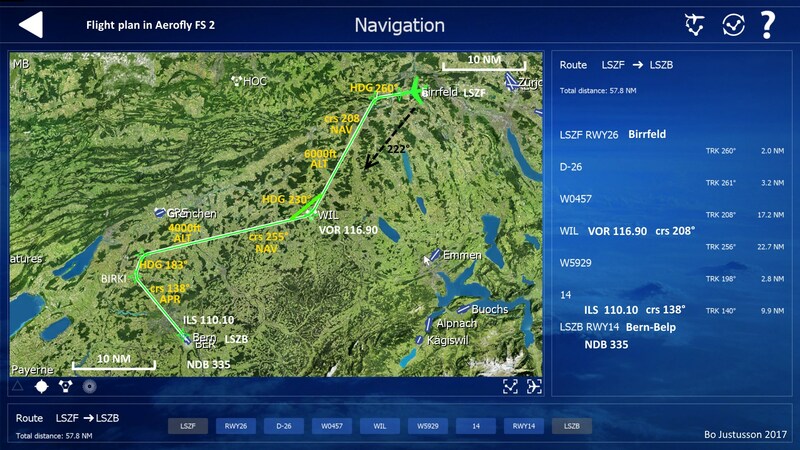 The approach to Bern has been setup by combining instrument procedures STAR and IAC for Bern airport. 3. hdg-bug 186°. At D22.7 WIL: HDG! 5. crs 138° on CDI1 (and ev.HSI), then NAV! 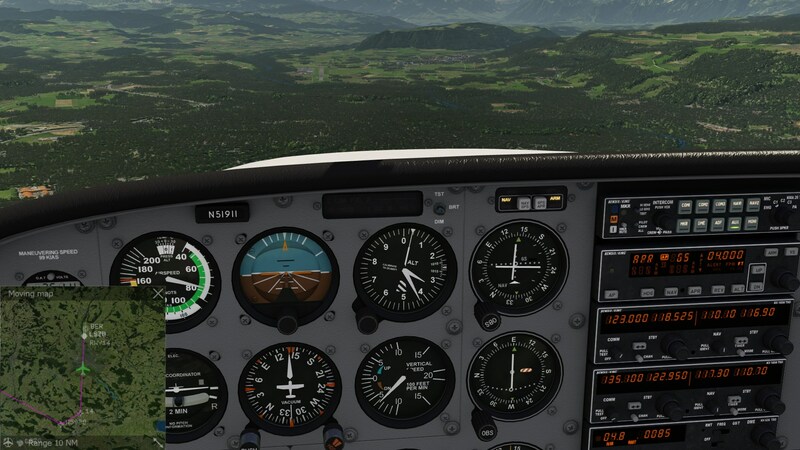 Max safe ILS+APR intercept angle is 30°. 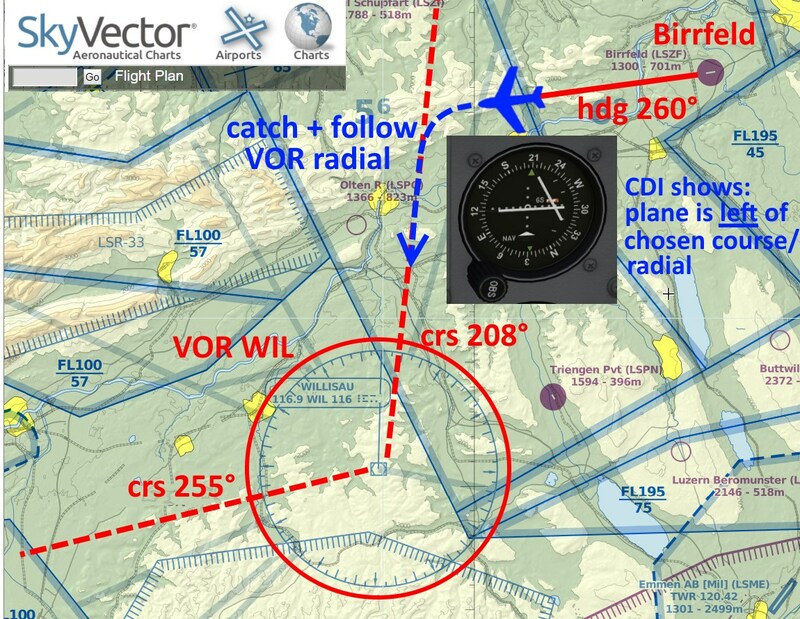 - Nav1 receives VOR: CDI1 shows TO-arrow and GS is not red. Beam nears from right. STAR Standard Instrument Arrival Chart. - Glide slope 3° (= 5%) is more common! - Thick dashed line shows go-around route. Fig 6. 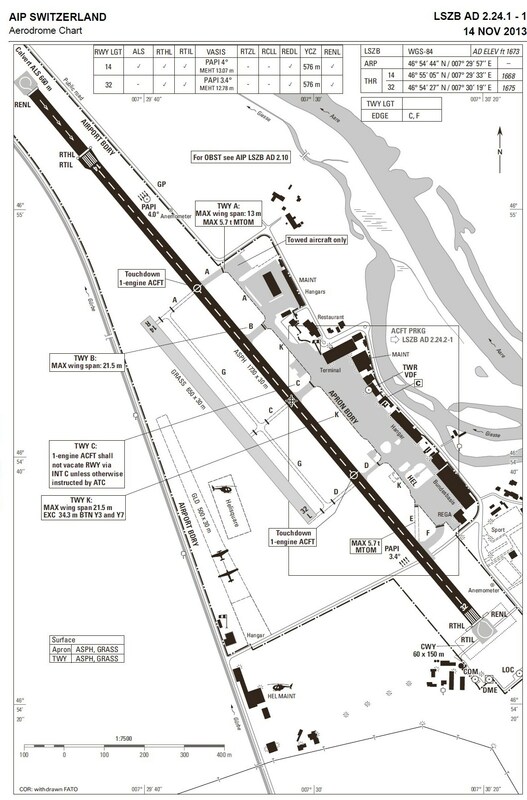 CDI shows plane on track - both lines near center! 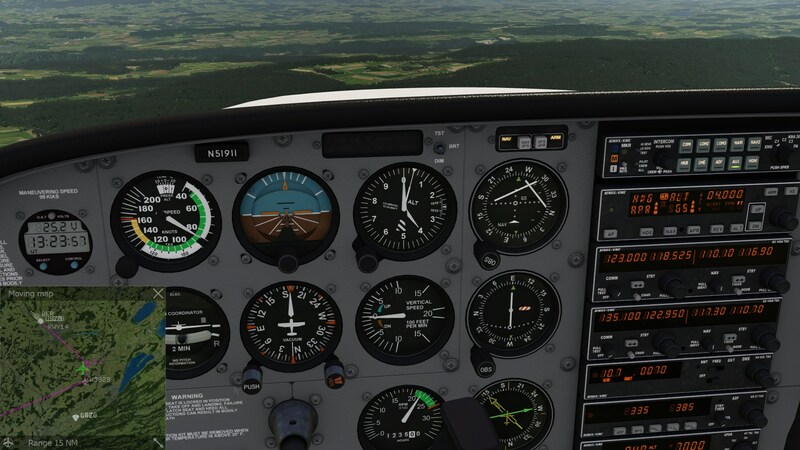 Reduce speed and flaps + gear down! glide slope is 4°, more common is 3°. More flaps! Fig 8. Closing in on runway. Setting point is 200/400m after white stripes. PAPIs are not correct in AFS2 - show 3°. Baron 58 is twin-engined, and is both heavier and faster than Cessna 172. First Baron came in 1961. 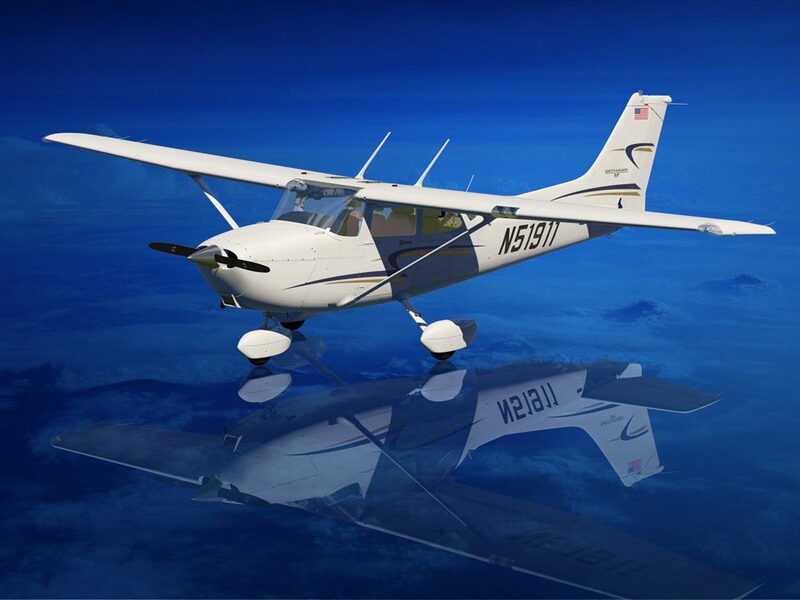 One of the most produced small business airplanes. Baron58 cockpit is sligthly more modern than Cessna172 in having a HSI (Horizontal Situation Indicator) which combines gyro compass and course deviation indicator. VOR-navigation is simpler with HSI, more info combined! Attitude indicator above and DME below. Same is used in glass cockpit below! In this sim-version, Nav1-radio guides both HSI and CDI1. - More advanced HSI let you select what to display on HSI: Nav1, Nav2, GPS, NDB. but can still be set with mouse wheel! The glide slope in HSI is shown with two yellow squares, one at each side. I find CDI1's white line easier to read. - Set ILS course in both HSI and CDI1! to VOR max 60°(45°?) - or you risk to over-shoot. Especially in fast jet aircrafts. - First NAV to catch LOC-crs, then APR and get GS. 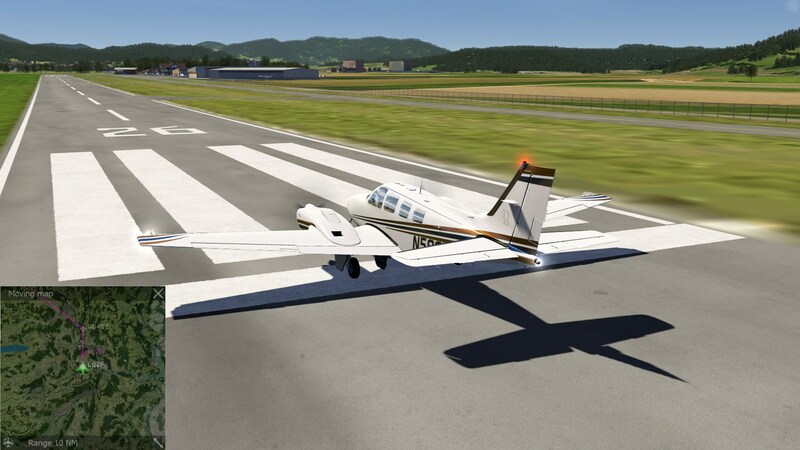 - Set flaps and Gear (F, G+F). - Keep speed well above stall speed Vs0 = 74kts. Vappr = Vref+40kts ~ 140 kts. if sidewind use rudder to line-up with Rwy. Fig B4. Baron 58 above Rwy 14 in Bern-Belp at night. Calvert landing lights. Plane too high? N.B. PAPIs are not correct in AFS2 - show 3°, should here be 4°. 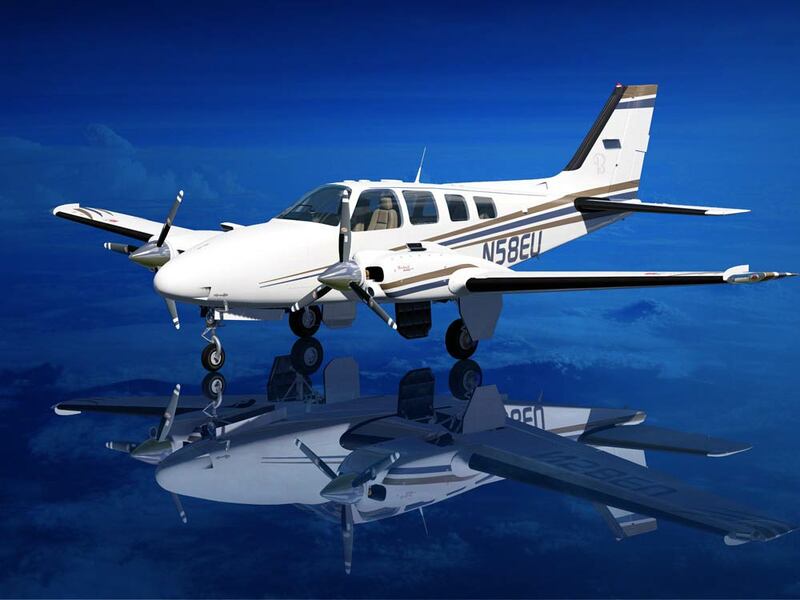 - Used by smaller aircraft flying at lower altitudes and in good weather. Pilots are responsible to keep distance to each other. - Planes shall be able to fly in dense clouds! - Larger aircraft almost always fly by IFR. - ATC (Air Traffic Control) is responsible for separation of aircrafts: VFR-planes shall be at lower levels than IFR-planes, and ATC follows each VFR flight by its transponder. - Test with low clouds and at night! Runway lights appear in "last minute". as IFR was before GPS & RNAV. 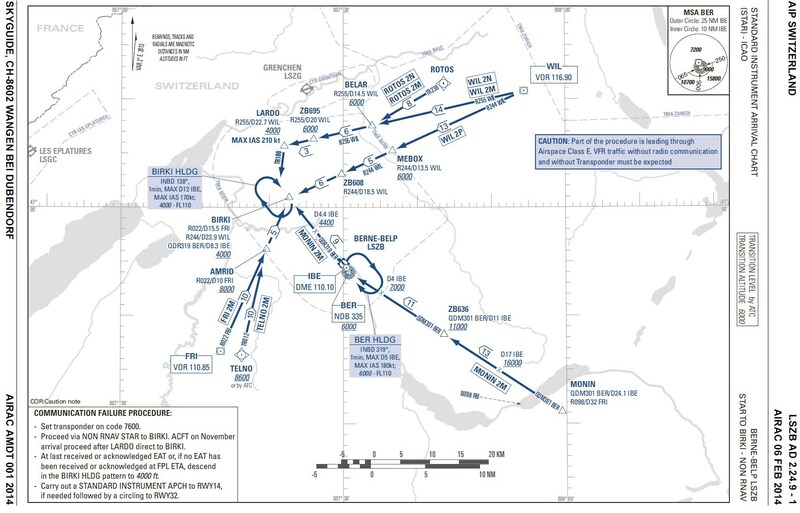 Routes were along Airways from VOR to VOR. only paper map, compass, NDB - as in 1930s.